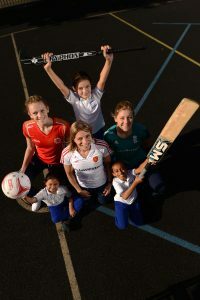 ECB “TeamUp” with England Hockey and England Netball to launch inspiring women’s sport campaign – Three Sports. Three World Cups. One Inspiring Vision. 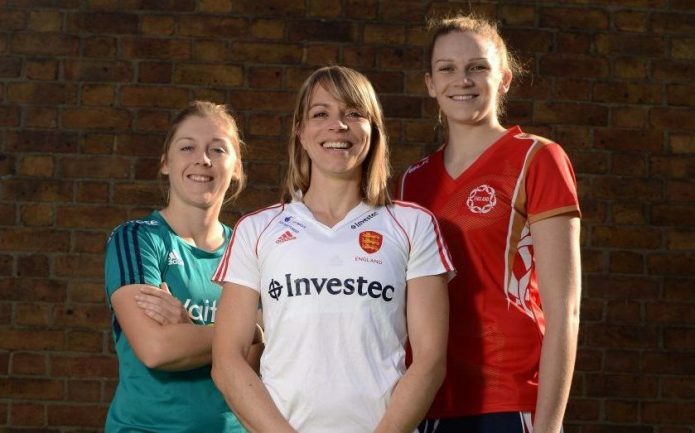 Marking a unique moment in time for women’s sport, the England and Wales Cricket Board (ECB), England Hockey and England Netball have today launched “TeamUp”, a three-year campaign to maximise the legacy of three home World Cups and build a fan base for women’s team sports. The next three years represents an unprecedented period for women’s team sports in England, with the nation set to host three consecutive women’s World Cups, starting next summer with the 2017 ICC Women’s Cricket World Cup and followed in 2018 and 2019 by the Women’s Hockey World Cup and Netball World Cup. In addition to promoting all three tournaments and encouraging women and girls to support each event, the TeamUp initiative has an ambitious target to ensure that all 7 to 13 year-old girls across the country have the opportunity to experience the benefits of team sport, and includes a novel rewards scheme for schools and teachers. TeamUp will have a significant impact on sport for girls in primary and secondary schools – with a goal to ensure 150,000 7-13-year-old girls have more access to team sport. The campaign has a target of over 5,000 participating schools each year; all increasing their offer of team sports for girls with at least 60% providing all three sports – cricket, hockey and netball. The initiative will have a long term effect on the delivery of school sport as it is anticipated that half of the 6,000 teachers involved in the scheme will also access free training offered in partnership through the Youth Sport Trust. Along with free training, once registered as a “TeamUp School”, teachers will have access to a variety of support resources. The more girls’ team sport activity they deliver the more reward points they’ll receive, which can be used for incentives such as free tickets to events, along with “golden ticket” opportunities such as being ball girls for a World Cup Final. The England women’s cricket team is currently in Jamaica preparing to play a five-match One-Day International (ODI) series against the West Indies, starting on Saturday 8th and Monday 10th October with the first two ODIs at the Trelawny Stadium in the Montego Bay area of the Caribbean island. The remaining three ODIs will form England’s sixth round of matches in the ICC Women’s Championship – the qualification tournament for the ICC Women’s World Cup in England in 2017 – and will be played at Sabina Park, Kingston on 14th, 16th and 19th October. Stafanie Taylor’s West Indies side currently sit in second place in the ICC Women’s Championship table, one place and one point above England, having last been in action in South Africa in February, when they recorded a 2-1 ODI series victory. With just two rounds of the Championship remaining, a 3-0 score line against the West Indies would see Heather Knight’s England side secure one of the four automatic qualification spots for the home 50-over World Cup next summer.